Symphony #4 "Window to the Past"
Symphony #2 "Symphony of Chorales"
Symphony #3 "Symphony of Sorrows"
Pittsburgh-born Gil Rose founded The Boston Modern Orchestra Project (BMOP) in 1996, and has been its Artistic Director since then. Within the first minute of the first movement of the first Symphony by Lukas Foss (who was born in Berlin in 1922 as Lukas Fuchs and came to the USA in 1937) you can hear – above all – the authority with which the BMOP approaches the music. Their playing never relies on implication (see later… Foss needs careful positioning in 20th-century music history). Rather, their superbly accurate and pointed, technically adept and justifiably passionate playing actually delivers; confidently and assuredly. Tempi and phrasing are planned and consistent; they're not the result of the music's at times excitable turns and directions. But there is no sense of such structure stifling the intent and intensity of Foss' music. It's a music which understands the symphonic idiom, while it may not prize innovation over conventional momentum. Orchestral color and the concepts of thematic development in the context of texture and timbre play an important part in Foss understanding of the (always four movement) symphony. As do very American broad themes such as that in the surprisingly brisk and unrelaxed adagio second movement of the First Symphony [CD.1 tr.2]. This was written in 1944, and has echoes of Copland; perhaps because Foss had "fallen in love" with America. A conventional piece, it's not really pedestrian. Notwithstanding the excellent musicianship on the part of the large Boston forces which specialize in modern American music – and play so memorably throughout these two CDs – Foss' music gets more interesting as it matures. Those new to the work of Foss will also find that Rose and his large New England orchestra achieve a splendid balance between controlled gentility and the element of surprise: Foss takes us where he wants to go, not where convention dictates… the minute and unexpected appearance of the piano at the end of that same movement for less than 10 seconds is an example. CD 1 has Symphonies 1 and 4 – from 1944 and 1995; CD 2 Symphonies 2 and 3 – from 1955-58 and 1991. After the unnamed First Symphony in G, the Second gravitates to the very center of Foss' radical side. It was written at the time when Foss was working at UCLA as successor to Schoenberg and exploring improvisation and some more recherché aspects of the acoustics of music. Its first movement [CD.2 tr.1] is highly angular – both in melodic design and the juxtaposition of instrumental dynamics… brass and strings. Less use of percussion is made in this (and the other) symphonies than by many of Foss' contemporaries. 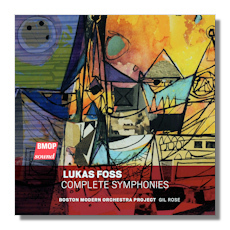 The Boston Modern Orchestra Project does extremely well in contrasting the rhythmic regularity of Foss' structures with the jumps and leaps which such movements as this opening of the Second Symphony abound; yet they quietly hold things together so that the substance of the musical energy is not lost. In common with the other three, this symphony seems to be making more of a gesture to acknowledge the possibilities – perhaps implicitly the importance – of mid-Century exploration of new musical ideas, than actually employing them in the ways that many of his contemporaries of course did. As a result, Foss' work has more in common with his teacher, Hindemith, than with, say, Henze. Performance celebrating such a tension is not always easy. Good players must avoid giving the impression of (a composer's) tentativeness, while underlining the sense that a challenge has been issued and is being met. This The Boston Modern Orchestra Project is extremely adept at. Their controlled and informed panache immediately and consistently allows us to dismiss any and all such concerns; the result is a musical experience that carries the listener with it at all times. The Third Symphony is entitled "Symphony of Sorrows"; it too reflects on the past, and (the composer's) memories – although these tend to be collective, "public". Yet the nostalgia (for time and place, and the time and place on and at which a piece of music was first heard, for instance) is distilled. Mere quotation or reference are the starting points, not the goals. Atonal in parts, the Third Symphony overtly references or is explicitly inspired by experiences in the twentieth century which would tend to suggest that desolation was humanity's lot: Eliot's "The Wasteland", Anne Frank, and the "Strifes and Struggles" of the world from which Foss came… there is a quotation of the "Horst-Wessel-Lied", for instance. As is the case with each of the last three Symphonies, Foss' writing is fresh and exciting if not actually surprising; and imaginative if not wildly novel. Foss' Fourth Symphony ("Window to the Past") was completed in 1995, nearly 15 years before his death (of a heart attack after suffering from Parkinson's disease) in 2009. It's another work which looks back, reviews his life, quotes from his earlier works. It's more personal in tone and center of gravity than perhaps any of the other works here. Since quotation is not enough, the performers need to understand the relationship past and present. This is something which the Boston Modern Orchestra Project clearly does. There is neither pastiche nor self-consciousness. None of these works is avant-garde in tonality, theme, construction, orchestration or even purpose. But they're varied and engaging; they explore the nature of symphonic expression intelligently. The aforementioned "Wasteland" (the third) movement of the Third Symphony [CD.2 tr 7] (which at almost 12 minutes is the second-longest single movement on these CDs), for example, uses tonality and textures in ways that are far from unconventional in the early 1990s. They embrace established ideas of how compositional structure supported a certain freedom of movement without actually adding anything of Foss' own. Rose and The Boston Modern Orchestra Project are completely aware of this positioning. In addition to not actually "scorning" Foss for what he did not choose to do, they achieve two resulting musical successes. On the one hand they explain and illustrate implicitly how this music fits into the American symphonic tradition of Copland, Sessions, Harris, William Schuman et al. On the other, they convey this music as music; as symphonic entities with stories to tell and pleasure to offer. They take it, almost, at face value. Yet infuse it with conviction and enthusiasm that makes listening to each symphony enjoyable. The acoustic of these four recordings in September 2010 (1), June 2013 (2, 3, 4) at the Orchestra's home in Jordan Hall, Boston, is spacious yet not overbearing or supportive of adverse rhetoric. Intelligently-miked, each soloist and solo section can be heard when they are to the fore musically – woodwind in particular. Orchestral color is important to Foss as it was in similar ways to Bartók… harmonica, mandolin, saxophone and harps appear in addition to the piano. The booklet that comes with the CD contains a useful essay on the composer's life, work and historical context, as well as sketches of Rose and the orchestra. Although – as said – Foss was no fierce innovator, his music is very much his own and deserves a wider audience. Almost as a supplemental task, these musicians help us see where Foss fits into his corner of 20th-century music. That alone makes this CD (which appears to be the only one in the current catalog of any of these works) very attractive. And it's one to be admired and returned to not only because it gathers these four works together, but because the players are so adept and convincing in their approach to and execution of the music.